Small town bank meets big time service! Bank of Alma offers 4 locations and can meet all your banking needs. You will find them in Alma, Nelson, Pepin and Wabasha. From loans to online banking, their friendly staff is ready to assist you. 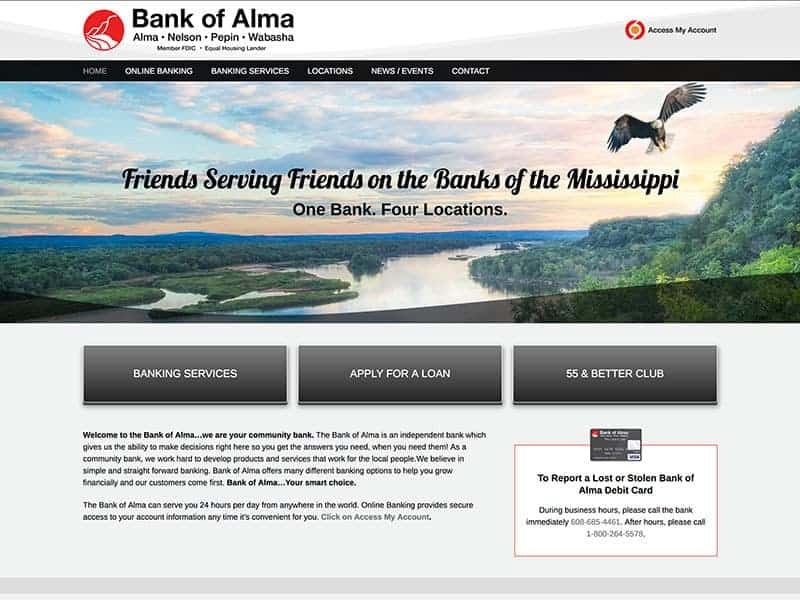 Bank of Alma went from a hard to manage HTML site to a clean, crisp, secure and mobile friendly website. The Vision Design team carried throughout the new site Bank of Alma’s branding and created a one of a kind graphic to identify their locations. Being a full service bank means a lot of information. The new website presents it all with intuitive navigation and call to action buttons. Additionally accessibility features were added to make sure impaired persons can also easily navigate the website. Staff is now able to make changes easily any time they need to. It’s a win, win! Need help with making your site ADA accessible? Just reach out and let us know.